*Price includes VRT & Warranty* Only €100.33 per week with a trade in or deposit of €9,000. Finance can be tailored to suit your deposit amount. Minimum deposit €3,000. 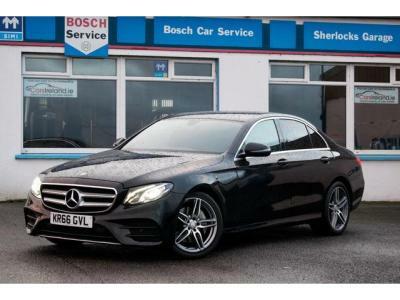 Top specification 2015 (152) Mercedes E220 CDi Bluetec AMG Night Edition in White with only 19,000 Miles. Black leather interior. Immaculate condition inside & out. Stunning car in Night Edition specification. One owner from new. Low road tax of €270 per year. AMG Night Edition Specification with huge specification including: 18" Alloy Wheels 7 Speed Automatic Gearbox LED Matrix Headlights With Auto Dipping & Cornering Lights LED Tail-lights Gloss Black Exterior Trims Interior Ambient Lighting (Colour & Brightness adjustable) Black Leather Interior Electric Seat Adjustment Heated Seats Climate Control Cruise Control & Speed limiter Satellite Navigation CD Player & Media System (SD Card Etc) Bluetooth Connectivity & Audio Streaming Front & Rear & Corner Parking Sensors Self Parking System (Mercedes Park Assist) Car is supplied with a warranty. Nationwide Delivery Available.